Welcome to the eRodent Chinny Pages. Update: Sadly both Fluff and Spike had dental problems. Fluff passed away on the 26th August 2005 from complications after dental surgery and Spike followed her on the 4th January 2006. They are much missed. Our current chinchillas are Fidgit and Basil. Fidgit is a beige chinchilla with a truly individual character who I 'borrowed' to live with Spike for his last few months and somehow never went home. We have recently rescued Basil, an 11 year old grey chinchilla, from Coventry RSPCA and having got him neutered are starting introductions. 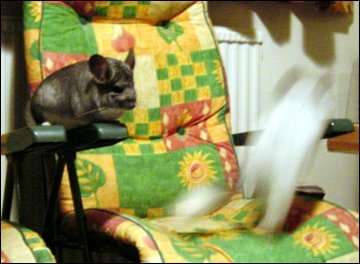 See the Introducing Chinchillas page for more information.